The overwhelming majority of vacationers in the Myrtle Beach area – and pretty much everywhere else, for that matter – get around to see the sights on four wheels, usually from the inside of a vehicle with the windows and roof separating them from the world outside. But, in a case of addition by subtraction, added freedom and excitement can be found by ditching two wheels and seeing the sights on just one pair – and the Grand Strand offers plenty of opportunities to do so via Segway, traditional bicycle or electric bicycle. Myrtle Beach Segway – This authorized Segway dealership, located just a 10-minute drive south of Bay View on the Boardwalk Resort, provides one- to two-hour Segway rentals so that you can take in The Market Common shopping/dining district in a new way – via a “glide” around the complex on a Segway personal transporter. You can explore The Market Common on your own after a short training session on Segway operation, or join regularly scheduled “glide” tours of the North Myrtle Beach Park & Sports Complex or Huntington Beach State Park. Rates start as low as $34 for the hourly rental. Pedego Electric Bikes – Also located in The Market Common, this business rents out electric bikes that allow riders to pedal when desired, then twist the throttle to have the electric motor kick in when they want a powered ride. Rentals start at $20 for 1 hour on a comfort cruiser, and the same bike can be procured for $75 for a full 8 hours. Premium and tandem electric bikes are also available for rent. 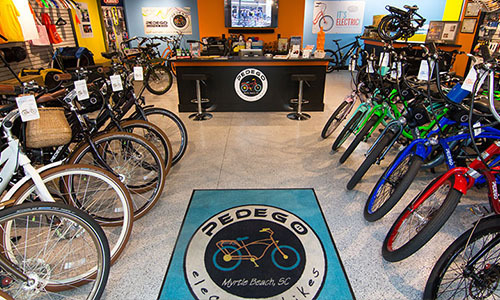 Beach Bike Shop – To do some Grand Strand sightseeing via traditional pedal power, take the short (and even walkable) half-mile trip inland from Bay View on the Boardwalk to this bike shop offering rentals of road bikes and cruisers by the day or week. Bikes can be ridden on the Myrtle Beach Boardwalk, easily accessible just out the back door of our resort, all day during the off-season and in the mornings during the summertime. Rental prices start at $15 per day for a cruiser and include a helmets, locks, and a map showing all the area’s bike-friendly roads and paths. Delivery and pickup of bikes can even be arranged for bike rentals of three days or longer. Next time you’re looking for a unique adventure during your beach getaway on the Grand Strand, consider taking in the Myrtle Beach area’s sights with one of these unique and exhilarating modes of transport. All of these options are easily accessible from the comfortable accommodations found at Bay View on the Boardwalk Resort – so book your trip today!